The final show I attended tonight was Vikram Phadnis. In wonderful setting where white branches with shimmery strings of beads and twinkly lights hung from the wall, this collection featured exquisitely detailed and crafted Indian wear in two sets. 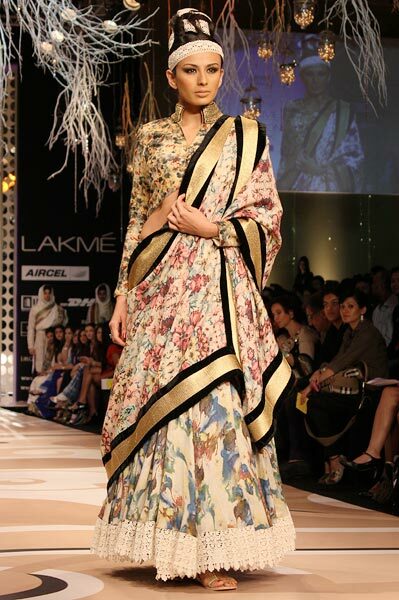 The first was set in white, biege and nudes embellished in gold, net, lace and brocade while the second had multicolored floral prints beautifuly blended with contrasting black and gold borders. I spotted some really wonderful sarees, lehengas and anarkalis. 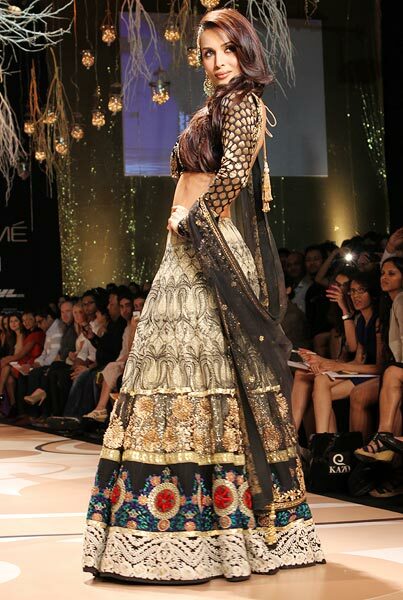 Showstoppers were the lovely sisters Malaika and Amrita Arora who were both wearing beautiful lehengas from either set. Glad you liked it! These are all traditional Indian clothes that are usually worn for weddings. Do a google search and you will be able to figure out how to remove word verification. You might have to temporarily switch to the old blogger style to do so if you're using the new interface. I think its fine now and this only thanks to you! You are my hero! :P hugsss!